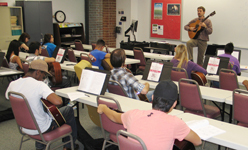 Dr. Justin Hoke is a devoted guitar teacher offering guitar lessons in Wilmington, NC and internationally via skype. He is currently accepting a limited number of guitar students. or email justinhokeguitar [at] gmail.com for more information. Study with Dr. Hoke through the UNCW Community Music Academy. To register and find out more information visit the website: http://www.uncw.edu/music/academics/cma/. Dr. Hoke is the director for the North Carolina All-State Guitar Festival, designed for outstanding guitar students in middle and high school, ages 12-18. Registration Form. Current music faculty member at the University of North Carolina Wilmington. B.M. The University of North Carolina Wilmington. Graduate Teaching Assistantships at Florida State University and Appalachian State University. Previous music faculty member at Tallahassee Community College and Emory and Henry College. © 2019 Justin Hoke Guitar All Rights Reserved.